Community Services is the largest of the Western Bay work streams, so much so that it’s now regarded as a Programme in its own right. The Community Services Programme focuses on the transformation of care services for older people by moving away from the traditional institutionalised models of care, to community-based support which helps people to live independently in their own homes and communities for longer. In September 2013, the four partner organisations signed up to a joint commitment to plan and deliver better community services. As part of the ongoing implementation of the joint commitment document, the Programme has undertaken a significant amount of work to implement the first priority of developing Intermediate Care tier services across Western Bay. The integrated approach between health and social care in Western Bay has overcome challenges around silo working and inertia in well-established organisations, while also working across geographical boundaries. The focus has been on expanding ‘Intermediate Care’ teams so that, where possible, people can be cared for in their own homes rather than be admitted into hospital. The approach also supports those leaving hospital, helping them to settle back into a safe and comfortable home. The Programme has developed a model of care for older people aged 65 and over. The focus of the model is delivering the highest quality of care throughout all of our services and ensuring that people are able to live in their own homes and communities for longer. The views of stakeholders (service users, carers, volunteers, third sector colleagues, local authorities and the health board) were used to shape the model, entitled ‘What Matters to Me’. The model takes a whole systems approach to improving Community Services, and it informs the work of the Community Services Programme on an ongoing basis. 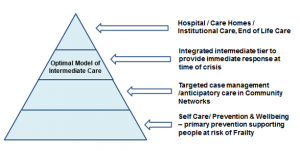 The Optimal Model of Intermediate Care comprises several key features that have been implemented across the region to ensure equity and consistency of access to services. It forms part of a wider strategic framework for delivering older people’s services, as shown above. Click here to view the Evaluation of the Intermediate Care Service Transformation: Summative Report. A Care Home Commissioning group has been established within the Programme, initially to develop a Western Bay Care Home Commissioning Strategy for Older People. The strategy is a long term vision of the requirements for the care home sector across the Western Bay area given the increased level of community services available. Over the past 5 years, the care homes market has become increasingly complex, with a number of different challenges, such as demographic changes, closure of homes, homes not meeting quality thresholds and increasing numbers of older people with complex needs. All four organisations within the Western Bay Collaborative have committed to participating in, developing and implementing a long term commissioning strategy for care homes for older people. The strategy envisages an environment that actively promotes choice and control, underpinned by robust quality assurance tools ensuring the delivery of effective, positive outcomes. It seeks to ensure that residents can access to information and advice, including advocacy, to make informed choices. Better access to care home services most suitable to people’s needs – Including the type and level of provision and other factors such as their preferred location, layout and environment. Increased choice for service users – This includes choice for a person about which care home they live in. Consistent high levels of quality standards for service users. Increased independence for service users – This focuses on the way services are delivered and should lead to people living as independently as they can in the care home they call home. Services that offer value for money – There is clarity, transparency and shared expectations about the fees paid to care home providers and the services delivered to residents. An effective and sustainable care home market. Attract high quality care home providers to the Western Bay area – Ensure the concept of developing and expanding business practices for care home providers is an attractive option within Western BayLocal implementation plans are being progressed, with work commencing on creating a pooled fund for care home accommodation between the Local Authorities and Health Board. Anticipatory Care Planning aims to support the development of integrated care, enabling proactive management of our most vulnerable residents who are already known to health and social care services. Its aim is to avoid unnecessary admissions to hospital or care homes and enable people to live in their own home for longer by providing a person-centred, co-ordinated, and responsive service. An Information Sharing Protocol developed specifically for Anticipatory Care allowing information to be shared with members of the Multi-Disciplinary Team. For further information on the activity of the Community Services Programme, please contact the Western Bay Programme Office via email western.bay@swansea.gov.uk, or telephone 01792 633805.